I have been back home for several days, still suffering from jet jag. I am going through my pictures and editing my video; the video should take at least a week to edit properly. We keep cool, in the pool. 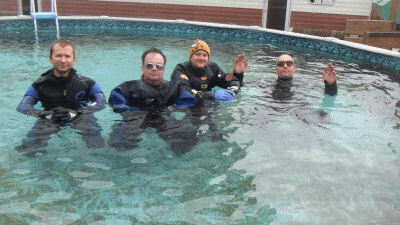 My deep, cold as “Hel” dive is over. I was offered another dive, but I was supposedly getting a ride from a lady who was driving back to Warsaw. A man named Valdek hooked me up with the ride over debriefing last night. I needed to pack, settle my bill with Kamil and hope and pray that the ride would materialize. Well, from what I have seen, Poles come through with their word, or as best they can. I drove in to town with Kasia and Kamil and another one of the Polish divers. Sure enough, Aga was at Nelson’s, drinking tea and talking to her boyfriend. “Are we going?” I asked. “Yeah, in a bit, you have time for dinner,” she said. 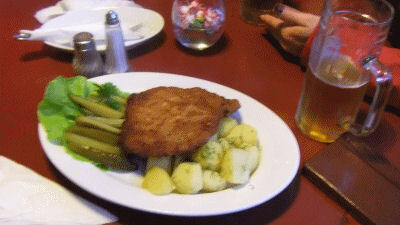 My last meal in Hel – Cucumber, fried pork and potatoes. Aga drove me all the way to my friend’s place in Warsaw, where she dropped me off. It was 1 AM, and I really hated waking my friends, Wiktor and Tusia, up at such an early time. 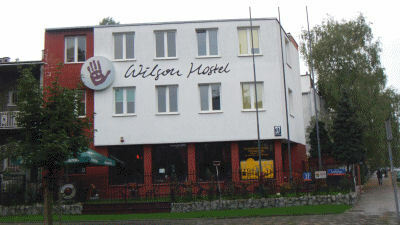 The Wilson Hostel in Warsaw – $40 a night for a private room and there is a bar downstairs! I spent the next couple of days catching up on my blog and unwinding from my trip to Hel and back. The Polish food, beer and Vodka made the couple of days seem like a few hours. It rained all the time though. 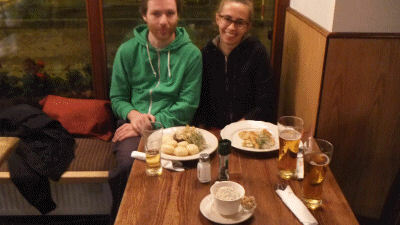 I treated Wiktor and Tusia to a meal and beers for all the help they gave me. Tuesday, I took a cab to a cheap hotel close to the airport, where I stayed until my early flight out the next morning. That’s exactly why I went, because diving is just not about what you see under the water. It is the people you meet, the place that you go and the entire experience of the trip. Diving in Hawaii with a bunch of other American tourists sounds boring. I don’t know; I’m broke. Anyone want to go to Albania? Oh now I get it…You can meet Mexicans and Americans right here at home unlike Polish (you, Merik and PDP?). Still I think you could find some warm diving with 100′ vis in an interesting and relatively unmolested country (maybe Indonesia). Glad you’re home safe and sorry for disturbing your rest the other day. Back from your adventure in Poland,,, what are your plans for opening night bug season. Hey Halibug, I’m on a boat out of San Pedro tonight. Won’t get back until 7 AM. BEST OF LUCK!